Cadbury Dairy Milk, a familiar name that you will know if you are a chocolate lover. Was called by a friend to help Cheeserland in her Sharing-Happiness-video casting. Since it is a new stuff to try out and can help a friend, why not? There goes my "virgin" of acting in a video where there are multiple cameras with numerous spot lights pointing on you. Can spot how many spot lights are there in this scene? Red hair with red handbag. Fashionista! We took turn in recording the video and sometime you just gotta assume she is doing something and you should have the correct response. I can has a magical bag where I can get everything I want including a HUGE Gas Tank! Please pay attention to Ringo's facial expression after I pulled it out wahaha. Had a lunch break and Audrey ordered this big set of western burger. It as so big and I wonder how it could fit inside her tiny mouth? This is how it looks like. The burger is almost equal to her face's size. Ends up Audrey eating separately after the first bite wahaha. Tips: If you are doing video shooting, try to avoid fried/oily food because your face will shine later after the meal. Unless you are acting in a facial cleansing product advertisement later? The shooting was finally finished around 3PM ++ since we start casting early in the morning. It was tiring but fun throughout the whole process. The spotlights can easily melt us especially the chocolates. Luckily I don't need to wear make up lol. You gotta learn how to have strong imagination when you are acting alone. Done something that I would never able to do if I didn't start a blog. Blogging does open many kind of opportunities to me and I do appreciate it! Person behind the scene. S.H.E. 4 fun people from Jo Mama Productions~! Since they bought a huge tank of Helium Gas for the shooting, they figured out there is one way to finish up the tank. Sounds fun to try but you will definitely have a head rush while having the chipmunk voice temporarily. They Row their boats with Chipmunks voice. Imagine when Chipmunk star talking dirty? Watch the video above~! And here is the final video that we did for Cadbury Sharing Happiness campaign~! 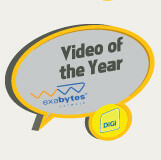 In case you guys are not aware, we have been nominated under the Video of the Year category for DiGi's WWWow Awards, honouring the best of the best on the Internet today! So don't forget to Facebook Like for us if you had a good smile on your face. Wonder where I went after finish the video shoot? Jess Lee, ManHand and lots more local artists that gonna present in Tiger Asian Music Festival 2011. Read it HERE.